Named in honor of renowned British naturalist Alfred Russel Wallace, who discovered the species in 1859, Wallace's golden birdwing butterfly (Ornithoptera Croesus Lydius) is an insect of indescribable 'beauty and brilliancy'. 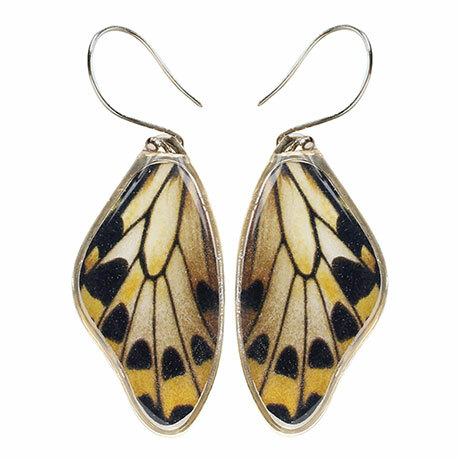 Earrings are individually handcrafted in California using an art print image of this rare and exotic butterfly, encased in a crystal clear resin and sterling silver. Earrings hang 2 ¼ from sterling silver earwires. Storycard included.